The clarity afforded by history proves Miles Davis’ second great quintet vying for the unofficial honor of being the finest small jazz combo to ever record to tape. 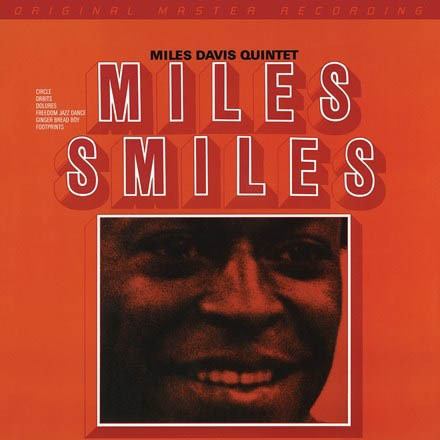 Originally released in 1966, Miles Smiles is largely responsible for the feat. The piles of evidence lay within the thrills, adventurousness, and curiosities staked to every composition. At once accessible and unpredictable, songs reflect an ever-changing mentality, an edgy mood, and a triumphant will—with each corner the band rounds serving as a new opportunity to integrate and interact, anticipate and respond, investigate open spaces and establish if not fully lock into contagious, broad, striding grooves. Music would never again be the same. Neither will experiencing Miles Smiles once you hear thIS definitive-sounding vinyl reissue. Mastered from the original master tapes and pressed at RTI, Mobile Fidelity’s numbered 180g 45RPM 2LP set Mobile Fidelity 180g 45RPM 2LP Set (Strictly Limited to 4,000 Numbered Copies); take the landmark effort into rarified sonic territory. Davis and company play against coal-black backgrounds that serve to illuminate every detail, texture, and nuance. Superb separation and plentiful air allow instruments to fully blossom, effectively taking you into Columbia’s 30th Street Studio to watch the legendary combo transpire before your eyes. The brilliance of Ted Macero’s original production springs forth from every passage. Never before has this standard-setting record burst with as much palpable verve, energy, and spirit. Experience it as how Davis and company heard it go down on the studio floor!